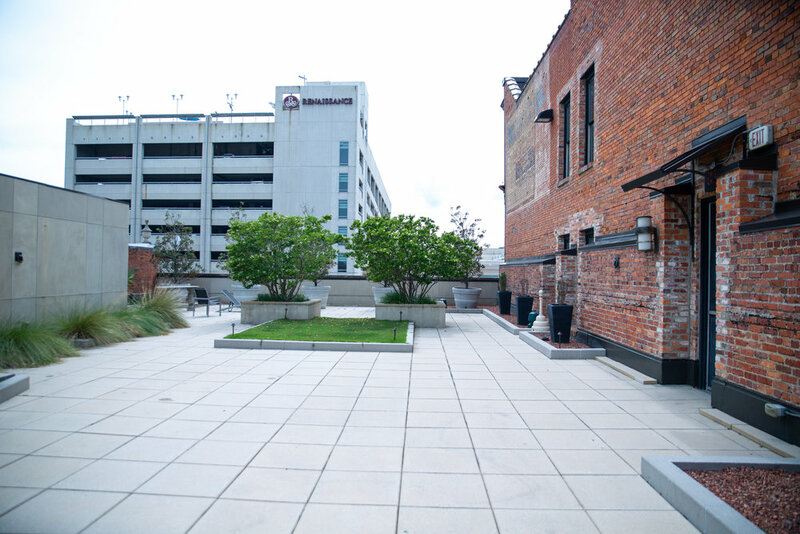 Description: An amazing location for a downtown Montgomery wedding. A fantastic space filled with personality in the ballroom and some great nooks and crannies for personal pictures. Recommendations: A rooftop wedding in July is goign to be really hot, you’ll want to make sure you plan as brief a ceremony as you can. Your makeup should be weatherproof and all the women in yrou wedding should have hankies to help deal with prespeation. Remember dab don’t wipe. Sunset is at &:48pm so you’ll want some evening time set aside to take advantage of the great sunset we should for pictures of you and your husband. I’d advise at least 30 minutes as it gives us a little time to get some great cityscape pictures. You’ll also want to do your recessional to a private space and have someone clear the roof of everyone not in the family pictures while you and the wedding party remain out of site. If your guests can see you they won’t leave the space and it will make your formals very chaotic. A great cozy area for quiet pictures during the reception. The ballroom is clean even if it’s a little plain. Your decorations will make or break this space. Another quiet area for a great picture..